Have Stormtrooper boots set foot at Puzzlewood for Star Wars: Episode VII? Our good friend Dion over at Star Wars Always pointed us towards an article posted at The Daily Mail. What I found the most interesting was this photo of what appears to be a Stormtrooper without armor on, but the shoes kinda sound like what we heard about in older reports regarding a slight alteration to the feet/shin area. I’m not a 501st dude, so I’m not exactly sure how different these boots are. They look like the old boots to me. Our good pal Jeremy Conrad from Now, This is Podcasting! 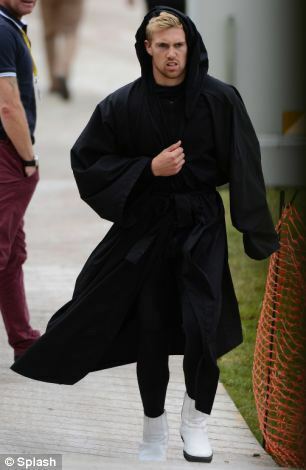 and Furious Fanboys notes that the cloaks are the same as the ones used for the J.J. Abrams Star Trek films to obscure costumes. The leotard also seems to match what a Stormtrooper wears underneath their armor. As we noted yesterday and today, shooting for Star Wars appears to be going down in the Forrest of Dean’s Puzzlewood. We even have a great friend of ours telling us some security from the Abu Dhabi shoot is at Puzzlewood right now, so this appears to be happening! And here is a screencap from A New Hope of the original Stormtrooper boots.